Let’s begin with a quick overview of what a Chromebook is. Essentially, Chromebooks are light and cheap laptops that run Google’s ChromeOS operating system. Most laptops run Windows 10 as their operating system, unless you have a MacBook, which uses macOS. ChromeOS is a lightweight OS, which means it’s not as fully featured as Windows 10 or macOS. In fact, when ChromeOS was first released in 2011 it was extremely barebones, and you needed an internet connection to use apps such as Google Docs. ChromeOS has evolved since then, so you can now install apps – including Android apps – and use it without an internet connection, but it’s still more limited than Windows 10 and macOS. However, that's one of the reasons why Chromebooks are so appealing to many users. Because ChromeOS is a lightweight operating system, it doesn’t need powerful components to run, and it can use hardware that Windows 10 or macOS would struggle to run on. This enables Chromebooks to be much more affordable than other laptops. It also means Chromebooks have impressively long battery lives, easily lasting a whole work day on a single charge. 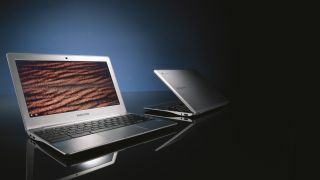 The first Chromebooks were released by Samsung and Acer in May 2011. While we sometimes refer to the devices as ‘Google Chromebooks’, a number of major laptop manufacturers make Chromebooks, with the likes of Dell, HP and Asus joining Samsung and Acer. Of course, Google has released its own Chromebooks over the years as well. Interestingly, while most Chromebooks are affordable alternatives to Windows and Mac laptops, Google’s Chromebooks, like the Google Pixelbook, are premium devices that show that a Chromebook can be as powerful, and as beautifully designed, as any MacBook or Windows laptop. What software can a Google Chromebook run? Because Chromebooks run ChromeOS, you can’t simply install and run Windows or Mac programs. Instead, you use Chrome apps, or online apps that you can run through the Chrome browser, such as Google Docs. There’s a decent selection of Chrome apps, and using online apps like Google Docs means you don’t need to mess around installing apps, which means many Chromebooks only need small hard drives – which again helps to keep their price low. Chromebooks are now also able to run Android apps, giving Chromebook users access to thousands of apps through the Google Play Store. Most modern applications have a version for Android devices, which means Chromebooks can run a huge range of software, from office suites like Microsoft Office to photo editors and even games. Chromebooks can also run Linux applications, further bolstering the productivity benefits of the devices. Compatible Chromebooks can now use programs that were created for Linux, the open source desktop operating system. While ChromeOS used to be seen as a limited operating system, the scope of the software you can now run on a Chromebook is truly impressive. ChromeOS is also a lot less prone to viruses and malware compared to Windows 10; malicious users are more likely to attack Windows 10 devices due to their popularity. Using cloud-based services on a Chromebook also limits the number of files you download and install, and ChromeOS is automatically updated with the latest security patches to keep you safe and secure. Because of the affordability, long battery life and security of Chromebooks, they've become increasingly popular in the education sector. They're ideal laptops for students, as they come with pretty much all the software they would need, including word processors and presentation programs. The use of cloud services such as Google Docs also allows for online collaboration between students and teachers, and several manufacturers have made Chromebooks that are specially designed for students, with durable bodies that can survive being tossed into a backpack and carried around all day. The Chrome Education License also enables schools to provide Chromebooks to students and easily manage the devices centrally, ensuring that only approved apps are installed. Parental controls can also ensure that students are kept safe from inappropriate online content. So, to answer to the question 'What is a Google Chromebook?' Essentially, they're affordable laptops with simple designs, that can surprise you with how flexible and adept they are for many day-to-day tasks.